We have been building Chinks for decades. These leggings are constructed with the standard yoke tops made from premium leather. 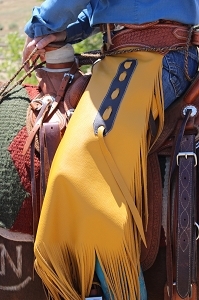 Horsewright Chinks are built with a small belt and buckle in front for safety, with a larger belt and buckle in back or an optional laced belt. Combined with the three buckle leg closures, this provides ample adjustment for your Chinks. 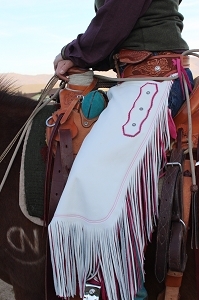 Options include contrasting fringe, pockets, tooling and conchos. These Chinks are made to your measurements for an excellent fit and will provide you with years of wear and protection.